“Composing Diary” is an ongoing series detailing my misadventures in writing a piece for Alarm Will Sound. You can see previous entries here. “Rust and Blue,” by Mark Rothko. Presented under fair use guidelines for criticism. I could do this forever. But I still have a piece to write. Gotta figure something out. The next strategy of breaking the funk is to fill my eyes and ears with idea food. The great thing about being an artist is that there are ten million different ways to procrastinate that can still help you with the task at hand. When I’m paralyzed by severe writer’s block of this magnitude, my go-to coping mechanism is to consume art by others. This includes score study, of course – John Adams and I have gotten quite close this week. But the artistic landscape is so much more complex than the tiny swath of it which art music makes up. There are valuable creative lessons to be learned from graphic novels, short stories, cinema, you name it. Any artistic form in which expectations are set up, to be either fulfilled or defied; in which disparate elements are played against and in harmony with each other; any art that requires an investment of time and energy in order to be understood and appreciated holds a lesson for an artist in any other tradition. It’s why no matter how busy you are, I always recommend sacrificing time in the practice room or at the writing desk to read a good book, see a movie, or visit an art museum. As the incredible Alex Shapiro would say, that’s where the music comes from. Today my attention is being given to a few different pieces. I’m getting back to tearing through my most recent Best American Short Stories acquisition. Shortly thereafter I’m moving on to a few Wilfred Owen poems. I think briefly about making a trip to the always-inspiring UMMA, but the freezing grey weather gets the better of me. Instead, I’m looking at some of my favorite paintings by the always incredible Mark Rothko. Rothko is, in my humble and barely-educated opinion, one of the best American painters to ever live. I say this because… well, for one thing, it’s true. For another, I identify strongly with the idea behind “Color Field” painting. The Wikipedia article offers a great, detailed description of the history and tradition of Color Field. It’s a diverse and storied tradition with a complex heritage, but some threads emerge, including a primary one: stark, vibrant colors in contrast with one another. Within the abstraction of this contrast are hard-hitting, soul-shaking questions and emotions. And no artist exemplifies that theatre better than Rothko, who once said that his paintings were about, among other things, “tragedy, ecstasy, [and] doom.” Dramatic, epic catharsis conveyed with the use of a handful of colors – just like in music, every emotional reaction comes purely from contrast. 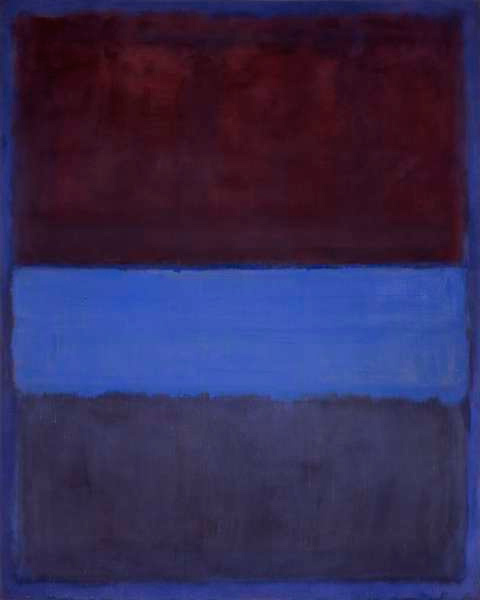 Tonight I meditate on one particular Rothko: Rust and Blue, from 1951. I’m not looking for anything in particular, having forgotten for the moment about my somewhat urgent quest for inspiration; I just admire the structure, the complex texture of each color and the story the painting invites. Why these three colors? Rothko was, especially in his later years, consumed by color, and would use countless unorthodox methods to get the right ones – what brought him to pit these three against one another? Once he chose his materials, what prompted the placement? The blue in the middle could have gone just as easily and with just as satisfying contrast on the bottom, right? And the title… “Rust and Blue” are two colors, where the painting has three. The rust is clear, the blue is clear, but the bottom color is… something else. Is it a blue? Sort of. Perhaps Rothko meant it to fall under the large auspices of that single word, along with the middle color. Perhaps he meant it as a subsidiary element, a supporting character to the violent juxtaposition of the two colors in the upper two thirds of the painting. Or maybe the answer is something else. Of course, getting answers to all these questions isn’t really the point. At the moment, I’m more fascinated by the very fact that a painting with no concrete elements, only abstract ones, has the ability to ask such questions. The title, which is so often a way to cover abstract elements with a concrete blanket, is no help – all Rothko’s titles usually do is remind the viewer what they see. Everything is in the abstract. And yet, there’s a narrative. A story. So tonight, it turns out, I’m inspired after all by the art I’m consuming. I’ve been fighting to get started, but telling myself that the starting place must be a title. I’ve been convinced for a long time that the right place to begin a story is the name, and that the elements follow from there. But with these piece, seeing as that hasn’t worked, I’m going to try something different. I’m going to work without a title, and tell my story completely through contrast and color. And like Rothko, I’m going to think in color. Did you know that Color-field painting emerged in New York in the late 1940’s and early 1950’s. It was a type of art inspired by European modernism and made popular by artists like Mark Rothko and Barnett Newman.